My MGB's overdrive transmission was leaking oil around the speedometer drive, because the seals were original and had never been changed. Since replacing the seals, there have been no more leaks. 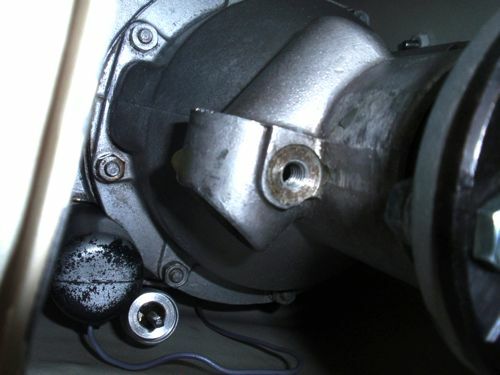 The pinion bearing unit can leak oil from two places: from between the bearing unit and transmission housing, and from the center of the bearing unit. There is an outer O-ring and an inner seal to prevent leakage from the two places. The outer O-ring is easy to replace, but the inner seal is more difficult, and as far as I could tell, there is no procedure described in any manual. You can purchase and replace the outer O-ring and inner seal for less than $4, or you can purchase the whole assembly with new seals for $80. I would think there are people who would opt to save $75 if they knew how to do the job. Below is my procedure. Disconnect the speedometer cable and remove the right angle adapter from the transmission. Remove the speedometer pinion bearing assembly set screw and copper sealing washer from the rear of the transmission using a socket wrench, extension and 1/2" crow's foot. Pull the bearing assembly out slightly until oil starts to drain from the set screw hole. Note that oil will drain down over the cross member, so be ready to catch it. Remove the pinion gear and O-ring from the bearing assembly and clean the bearing assembly with solvent. 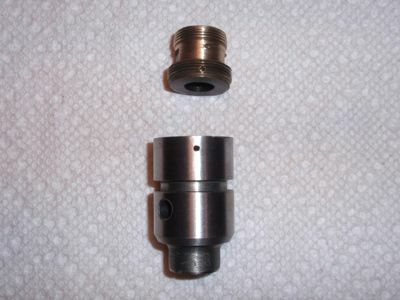 Locate the small dowel pin in the bearing assembly, and drill it out as shown below. 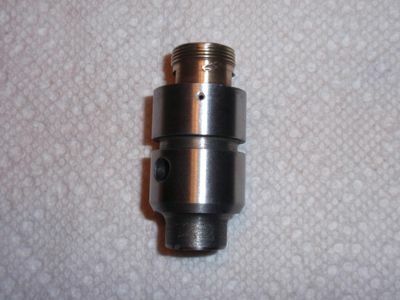 Start with a small pilot bit and finish with a 1/16" bit. Do not drill all the way through! 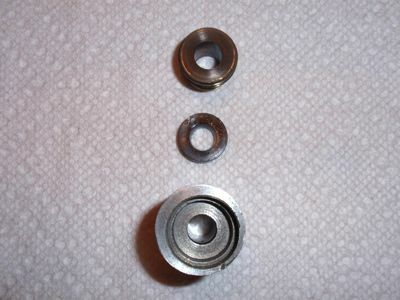 Disassemble the bearing assembly as shown below by unscrewing the inner brass piece using a thin 5/8" wrench. If needed, purchase a cheap 5/8" wrench and use a bench grinder to make it narrower. 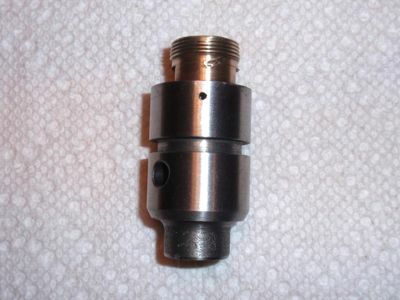 Push the seal out from the small end of bearing assembly as shown below. Use a small, soft instrument such as a wood dowel to prevent damaging the inner bearing surface. 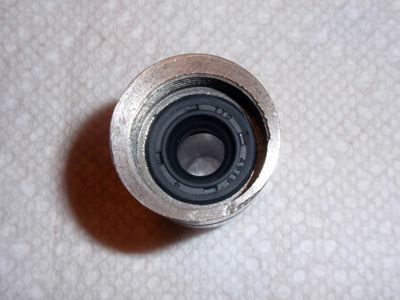 Clean the bearing assembly thoroughly and push in a new seal as shown below. Screw the bearing assembly back together and tap in a 1/16" D x 1/4" L roll pin. Trim the excess length of the roll pin flush with the bearing assembly. Install a new O-ring on the bearing assembly. Apply oil to the inner seal and inner bearing surface along with the pinion gear shaft, and insert the pinion gear into the bearing assembly. 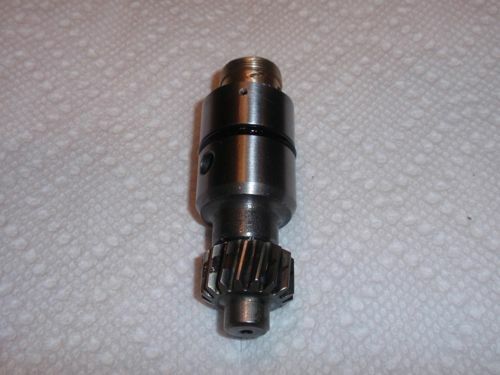 Apply oil to the O-ring and pinion gear and reinstall the whole assembly with the set screw and copper sealing washer. Reinstall the right angle adapter, and connect the speedo cable to the transmission. Refill the transmission with oil until the proper level is shown on the dipstick. Comments on "MGB Speedometer Drive Pinion Bearing Seal Replacement"